We almost certainly do not know all the Pools in Mexico. Are you missing any? Contact us!. Please use the get in touch with information provided at every pool profile to check if they are offering aquagym lessons, because isn't so typical to see an Aquagym in Mexico. Swimming is a sport for all ages. It helps young persons to tone their muscles and grow wholesome and strong. For the elderly, there's no much better way to workout than locating a Mexico Swimming Pool to escape from daily routine. Regular users of the following Mexico Pools told us the most necessary factor about swimming is to control your breathing. At times this is not possible mainly because we raise the neck to breathe and also the body just isn't aligned. To avoid this, our head really should be aligned with our spine all of the time. Not all countries are the same, and swimming rules and regulations are changing from one country to the other. So, if this can be your first time looking for Mexico Pools, be sure to call the premises prior to you drop by. Swimia.com has the most up-to-date database on the internet about almost any Mexico Swimming Pool. Classified by countries, regions and cities, it's straightforward to find the nearest pool at the places you visit. 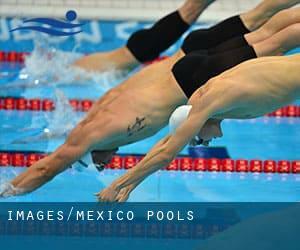 For Mexico, you could have a look at the pools we have gathered for you. One in the advantages of outdoor swimming in Mexico is the possibility to sunbathe during the summer season. Taking it with additional care, sunbathing is healthy given that introduces Vitamin D into the body, so the most beneficial option seems to be switching in between indoor and outdoor pools depending on the season. There are several reasons why it's best to choose a heated swimming pool in Mexico. Essentially the most crucial one relies on the importance of keeping the body temperature stable. When the water is too cold, your body will try to warm it up and you will lose strength to swim properly. Enjoy the best indoor pools in Mexico and don't worry about the weather. These facilities are open all seasons and you can enjoy a swim at the same temperature every day of the year. Holding an estimated population of 12.294.193, Mexico City is among the most important cities in Mexico. Check all of the Swimming Pool in Mexico City and its surrounding area. Whereas Ecatepec de Morelos is one of the six most populous cities in Mexico with almost 1.806.226 residents, you shouldn't miss that one if you're going to Mexico. Swimming is often a terrific concept to keep your body active throughout your visit to Ciudad Juárez (Mexico), or perhaps if you are a local. Swimia helps you to discover your closest Swimming Pool in Ciudad Juárez. It's difficult to visit Mexico devoid of dropping by Puebla (with 1.590.256 residents). Currently Swimia is showing you all the Swimming Pool in Puebla and the closest pools situated in its vicinity. Without a shadow of a doubt, swimming in Iztapalapa is the perfect method to unwind after perform. 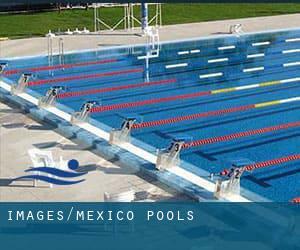 Take a couple of minutes to browse Swimia's catalog to find a Swimming Pool in Iztapalapa. Let us tell you a secret to switch off when you're in Guadalajara: just pick out a Pool in Guadalajara and plunge into the water! There's no even more efficient method. Centro Comercial Mundo E, L6-C , Blvd, Ávila Camacho No 107 , Colonia San Lucas Tepetlacalco , Tlalnepantla , Mex. (Postal Code: 54055). Swimmers like you reported 25 meters, 5 lanes, 1.4 meters depth, 1.4 meters depth, Indoors. Unfortunately we do not have the email address of this Pool, but we can give you the phone number. Calle Rafael Cuervo # 35 , Granjas de Mocambo , Boca del Rio , Ver. (Postal Code: Unknown). Among all the activities offered by the center, in case you are keen on swimming you will enjoy 25 meters x 13.5 meters, 6 lanes, Indoors. Just in case you wish to make contact with this Swimming Pool before dropping by, we only know the phone number. Updated on 2019 Av. de las Garzas #3 , Puerto Vallarta , Jalisco (Postal Code: 48333). This sports center offers 25 meters, 5 lanes, Outdoors. Contact information for this Pool just like phone number and email address are number. Centro Comercial Santa Fe , Avenida Vasco de Quiroga 3800 , Colonia Antigua Mina la Totolapa , Cuajimalpa , DF (Postal Code: 05109). This sports center offers 25 meters, 4 lanes, Indoors. For this Swimming Pool, only phone number is number here. Centro Comercial Plaza Loreto , Altamirano 46 , Colonia Atizapan , Mexico City , D.F. (Postal Code: 5481). Among all the activities supplied by the center, if you're interested in swimming you are going to take pleasure in 25 meters, 6 lanes, 1.5 meters depth, 1.5 meters depth, Indoors. Just in case you want to get in touch with this Swimming Pool just before dropping by, we only know the phone number. Updated on 2019 Valentín Gómez Farías , Colonia Centro , Veracruz , Ver. (Postal Code: 91700). This sports center offers 25 meters x 12.5 meters, 5 lanes, Outdoors. Contact information for this Swimming Pool which include phone number and e-mail address are number. Huitzilihuitl # 30 , Colonia Santa Isabel Tola , Delegación Gustavo A Madero , Mexico City , D.F. (Postal Code: 07010). Among all the activities offered by the center, for anybody who is thinking about swimming you will take pleasure in 25 meters, 5 lanes, Indoors. Just in case you would like to get in touch with this Swimming Pool before dropping by, we only know the phone number. 8 Oriente Nº 2 , Cholula , Puebla , Puebla (Postal Code: Unknown). Swimmers like you reported 25 meters x 25 meters, 6 lanes, Indoors. Unfortunately we do not have the email address of this Swimming Pool, but we can give you the phone number. Carretera Guanajuato-Dolores Hidalgo Km 2.5 Rumbo a Valenciana , Guanajuato , Guanajuato . Few days ago a regular user of this center told us they offer Olympic size x 25 meters, Indoors. Furthermore, they keep in good conditions 20 meters x 20 meters diving well, Indoors. For this Swimming Pool, only phone number is number here. State Ecological Park «Sierra de Montenegro-Las Estacas» , Carretera Tlaltizapán - Cuautla Kilómetro 6 , Tlaltizapan , Morelos (Postal Code: 62770). Among all the activities provided by the center, if you are considering swimming you are going to delight in ~1km, Outdoors. If you might want to contact this Swimming Pool, e-mail address and phone number are both number. Updated on 2019 Blvd. Kukulcan KM11.5 HZ , Cancun , Q. Roo (Postal Code: 77500). Among all the activities provided by the center, if you are considering swimming you might appreciate Olympic size, Outdoors. Just in case you want to contact this Swimming Pool prior to dropping by, we only know the phone number. Miguel de Cervantes Saavedra No. 397 , Colonia Irrigación , Mexico City , D.F. (Postal Code: 11570). This sports center offers 25 meters x 16.5 meters, 6 lanes, Indoors. For this Pool, only phone number is number here. Avenida 16 de Abril , Lote 4 , SMZ 10-A , Cancun , Q. Roo (Postal Code: 77500). Among all of the activities supplied by the center, when you are thinking about swimming you are going to delight in 25 meters x 12.5 meters, 5 lanes, Indoors. Just in case you wish to contact this Pool just before dropping by, we only know the phone number. Fracc. Laguna Mar SM. 7 Mza. 75 Lotes 15 y 16, Carretera Sac-Bajo , Isla Mujeres , Q. Roo . Among all the activities offered by the center, for anybody who is thinking about swimming you will take pleasure in ~20 yards x ~10 yards, Outdoors. If you will need to get in touch with this Swimming Pool, email address and phone number are both number. Cafetales 253 , Colonia Granjas Coapa , Mexico City , D.F. (Postal Code: 14330). Among all the activities offered by the center, for anybody who is interested in swimming you will take pleasure in 25 meters x 12.5 meters, 6 lanes, Indoors. If you should contact this Swimming Pool, e-mail address and phone number are both number.